Hello fellow comic readers. Today I will be reviewing a series that I have been aware of since I got back into comics, but for some reason never had the interest in reading it. Then Tony and I came up with the idea to do a two part review of sorts. So I agreed to read one side of the series and he read the other. On the surface the story of Irredeemable is what if the worlds most powerful superhero, snapped and turned on the people he swore to protect. But by the end of the series Mark Waid has tackled a lot of interesting subject matter as well as played with the format of comics. As the series begins The Plutonian has already gone insane and is hunting down the members of The Paradigm. The first victim the book shows is The Hornet, a Batman-esque character. The Hornet is trying to get his family out because The Plutonian had found them. Sadly no one gets out of the house alive. And that sets the pace for the rest of the series. The Paradigm is made up of Qubit, Bette Noir, Kaiden, Gilgamos, Volt, and twins Charybdis (Cary) and Scylla. The members of the Paradigm really gives the book a strong basis for the reader. And the power sets of the members are really interesting. Far more interesting than The Plutonians power set which is basically Superman’s with less limits. The other interesting fact part to the Paradigm is that each member is keeping secrets from the rest. Whether it’s Qubit trying with all of his might to try to save Plutonian from himself, or Bette Noir trying to hide her one night stand with Plutonian in which she found the only weakness he has. As the story evolves The Plutonian shows less and less discrimination on who he kills or in some situations maims. There is a point where Plutonian manages to kill a large group of supervillains by tricking them into activating the self destruct on the hideout they are occupying. But as the story of The Plutonians fall gets revealed you learn more about his personal struggles with who he is, and his ability to fit in with a world that both fears and respects him. When the hideout is destroyed it kills Scylla, leaving Charybdis powerless. So when The Paradigm realizes shortly after that Plutonian is on his way to them because of a tracking device. Charybdis stays behind to buy the rest time to get away. However when Plutonian arrives it is revealed that the death of his brother didn’t leave Cary powerless it left him holding all of the power. After a brutal fight Plutonian barely escapes and Cary renames himself Survivor and elects himself the new leader of the Paradigm. The character arc of Cary is the spot in Irredeemable where the genius of Mark Waid’s writing really comes out. Within only a short time of having this massive amount of power Cary is fully corrupted by it to the point that the rest of the Paradigm can’t trust him. But Waid’s genius doesn’t end there. before long the powers of the Plutonian are given an explanation to just exactly how they work. And it isn’t a cop out of how the solar rays of Earth’s son interacts with his alien physiology. His powers are based on the fact that physics just purely don’t apply to him. Though even the Plutonian hasn’t figured out this fact yet. When Kaiden goes to visit Plutonians ex-girlfriend Waid gives the reader another interesting look at the cracks in the Plutonians foundation from the beginning. And you also get to see how spiteful he can be. She is left as the only person left alive in the city he used to protect. Essentially making her a scared slave in a destroyed city who knows he could kill her at anytime. Her story really serves to prove how even the people who were closest to him aren’t safe from his wrath. And it actually makes more sense after you learn the Plutonians true origin, and you see what makes him so unbalanced from the start. The only issue with the series to me was the way Waid wrapped it up. I understand what he was going for with the ending he put together, but it just seemed a little heavy handed to me. The Art of Peter Krause was a little lackluster towards the beginning of the series, but it quickly gets better as the issues go on. His layouts and storytelling improve as you read each issue. Then Diego Barreto starts to share the art duties and the art really starts to meet up with the writing. Both Barreto and Krause really handle the emotional and physical darkness. Eventually Barreto takes over completely and the book hits the strongest stride in my opinion. That may because of what is going on in the story at that point, or it could be Barreto’s art, or maybe it was a combination of both. 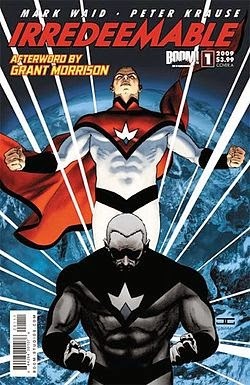 4 out 5- I highly suggest this series to anyone who hasn’t read Irredeemable. It takes the idea of the Superman style character and turns it on it’s head. As always, thank you for reading my review. If you have any comments or suggestion feel free to leave them in the comments section. Thanks again, and keep reading fellow comic readers.